Application:Home,parlor,study,villa,Hotel,Shopping Mall,Resturant,Bar cafe,Home decoration lighting, bathroom,lighting for bedroom,indoor stait lights,bathroom and so on. 1.Use a screwdriver to screw out the bolts which connected the mounting base and main fixture. 2. Fix the mounting base on the wall (wooden wall, using self-tapping screw to fix; cement wall, drill holes to install; if you have a suitable electric box to fix this wall light, that would be easier to install.). 3. Connect the power cords of the wall lamp to the 85V or 220V circuits (no distinction between the live line and zero line, one for live line and the other for zero line. If the wires were pretty long, please roll into a circle and place in a vacant position in lamp-chimney). 4. Put the main fixture onto the mounting base, aim at the bolt hole, then fix the screws. Input Voltage:AC85V-265V,50/60HZ, Wattage:12W, 840Lumen.Size: H280mm(11 Inch)*L110mm(4.3 Inch)*THICNESS50mm(2 Inch). This light made of high quality metal materials, safe and long lifespan. Modern, simple and fashion design, perfect for indoor, porch, hallway, lobby, cafe, hotel, bedroom, shop, living room etc. 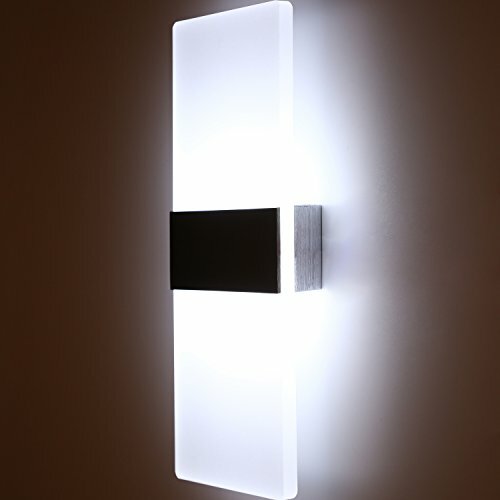 This light can light up your room just as an expensive light fixture do, but save more than 90% of power consumption. If you have any questions about this product by topmo, contact us by completing and submitting the form below. If you are looking for a specif part number, please include it with your message.